Black Friday and Cyber Monday is rapidly becoming the biggest online shopping days of the year and everybody likes a bargain. So we’re making a long weekend of it! 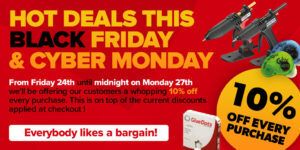 From Friday 24th until midnight on Monday 27th we’ll be offering our customers a whopping 10% off every purchase. This is on top of the current discounts applied at checkout! Gluegunsdirect probably have the largest stock of Tec glue guns and Tecbond adhesives in the UK, if not Europe, we will not let you down on service or delivery. If we advertise it on our website, we stock it.